IEER contributors (2005). 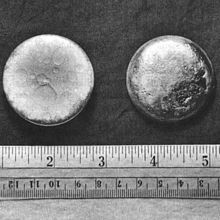 "Physical, Nuclear, and Chemical, Properties of Plutonium". IEER. Retrieved February 15, 2009. Samuels, D. (2005). "End of the Plutonium Age". Discover Magazine. 26 (11). Nuclear Weapon Archive contributors. "Plutonium Manufacture and Fabrication". Nuclearweaponarchive.org. Ong, C. (1999). "World Plutonium Inventories". Nuclear Files.org. Retrieved February 15, 2009. LANL contributors (2000). "Challenges in Plutonium Science". Los Alamos Science. I & II (26). Retrieved February 15, 2009. NLM contributors. "Plutonium, Radioactive". NLM Hazardous Substances Databank. Retrieved February 15, 2009. Alsos contributors. "Annotated Bibliography on plutonium". Alsos Digital Library for Nuclear Issues. Retrieved February 15, 2009.